This Detroit metropolitan area 511 case study will attempt to document the current landscape of traveler information systems and will provide a listing of all of the transportation providers in the region, and map out some strategies for an effective 511 implementation. The study will also examine some of the implications of deploying an abbreviated dialing number for traveler information services across international borders. The case study will also provide a glimpse into the public regulatory commission and the private communications providers within the state of Michigan and Ontario, Canada. As a point of reference, an overview of a similar telecommunication implementation - 311 - in the Detroit metropolitan area will also be addressed. This case study will provide a snapshot of the traveler information services in order to help plan and deploy regional and international abbreviated dialing (511) services within the in the greater Detroit metropolitan area. In particular, focus is on the three (3) county area made up of Wayne, Oakland, and Macomb - considered the major urban and suburban regions of greater Detroit. These three counties are a subset of the region's seven county Southeast Michigan Council of Governments (SEMCOG), which shares an international border crossing, the Detroit River, with Canada; home to another closely connected part of greater Detroit - Windsor, Ontario. Michigan, but more specifically greater Detroit, is considered one of seven "early adopter" regions for 511 implementation by the U.S. Department of Transportation. The other regions are Kentucky, Arizona, Minneapolis/St. Paul, Utah, the San Francisco Bay area, and the I-81 corridor in Virginia. The US DOT's Intelligent Transportation Systems (ITS) Joint Program Office is sponsoring this effort for the benefit of the entire transportation community. After several previous petitions requesting N11 assignment for uses besides the commonly known 411 and 911 services for information and emergencies respectively, the Federal Communications Commission assigned the number 311 for non-emergency police and state/local government services and 711 for telecommunications relay services under a First Report and Order in 1997. In that Report and Order the FCC also clarified jurisdiction over N11 assignment, citing the Communications Act of 1996, which allowed for State regulatory or other government entities to incur all or a portion of that jurisdiction. The use of 511 is envisioned to greatly expand upon the functionality of Advanced Traveler Information Systems (ATIS). Traveler information systems provide information to travelers either before the trip begins or during the trip itself. This information will allow travelers to avoid congested traffic areas, avoid traffic incidents of significance, and determine transit options, among other things, all in "real-time." The Detroit metropolitan area sits on the banks of the Detroit and St. Clair Rivers, which connects two of the Great Lakes - Lake Erie and Lake Huron. Across the river and south of Detroit, about five minutes by motor vehicle, sits Windsor, Ontario, a bedroom community to Detroit and the southernmost area of Canada. The greater Detroit area, and more specifically the entire SEMCOG region, represents approximately one-half of Michigan's population. Combined, the Detroit area houses five million people in an area of 139 square miles. Freeways, among them some of the oldest in the country, and interstates (including I-75, I-94, I-96), not only provide access to the entire region, but also link Detroit with the rest of the Midwest. Chicago is five hours by car to the west, the same as Toronto to the northeast. Toledo, Ohio, is one-hour south and Cleveland about three hours southeast. Two international border crossings - the Detroit/Windsor Tunnel and the Ambassador Bridge - provide for connectivity to Windsor, Ontario, and Highway 401, which traverse northeast to Toronto and Montreal, Canada. Two airports, one in the city and one 19 miles from downtown, serve the air transportation needs for a large portion of southeastern Michigan. Detroit Metropolitan Wayne County International Airport (DTW) is the 15th busiest airport in the world. Detroit is home to some of the largest daily newspapers in the US, the Detroit News and the Detroit Free Press. Overall, six daily newspapers serve Detroit. At last count, the area had eight television stations and 59 radio stations. In its 1999 Urban Mobility study, the Texas Transportation Institute ranked the Detroit area as the sixth worst in terms of traffic congestion in the United States. In order to try to continue to stave off total traffic gridlock, the Michigan Department of Transportation (MDOT) has undertaken an aggressive ITS expansion program on the Detroit region's expressway and Interstate system. An important step was the expansion of the Detroit ATMS/ATIS by MDOT completed in 1998. A previous system of traffic surveillance consisted of 32 miles of freeways involving segments of I-94, M-10, I-75, I-375 and I-275 in the city of Detroit which included 10 CCTV cameras, 14 changeable message signs (CMS), 49 ramp meters, and 1,240 inductive vehicle loop detectors. The ITS expansion meant that an advanced traffic management system (ATMS) and an advanced traveler information system (ATIS) now covered an additional 148 miles of the freeway system in metropolitan Detroit, including portions of I-75, I-696, I-94, I-96, I-275, M-39, M-10, and M-59. The expansion included installation of 145 CCTV cameras, 43 changeable message signs, 11 new ramp metering sites, 1,200 inductive vehicle loop detectors, as well as 12 highway advisory radio transmitter stations and an updated web site. Also during the expansion phase, MDOT's Michigan Intelligent Transportation Systems Center (MITS Center) in downtown Detroit was modernized to handle the additional traffic data, the new responsibilities for issuing traveler advisories, and renovated to accommodate the Michigan State Police (MSP), so they to could take advantage of the data and video images of the freeways provided by the project. "The most obvious evidence of ITS is the appearance of new, high tech changeable message signs suspended over freeways. Drivers are finding them helpful, especially when there is the potential for trouble on the road ahead. The changeable message signs are used to post notices in advance of both major closures as well as notices of recent incidents, so that drivers can plan an alternative route. In a recent survey of motorists conducted by the Southeast Michigan Council of Governments (SEMCOG), 73% remembered seeing the signs and 62% found them helpful, citing a savings in travel time, increased route choices or enhanced safety as the primary benefits. A 1996 study by Cambridge Systematics showed that it takes almost twice as long for traffic to return to normal after an incident as it takes to detect, respond to and clear the problem. And unexpected "incidents" are but one cause of backups. Construction zones, maintenance crews, weather and other factors have similar effects, especially when drivers are unprepared or make poor decisions during a traffic encounter. The message signs help drivers make better decisions, and may divert drivers from traffic tie-ups ahead. The ITS Deployment was a springboard for MDOT to contract with a company to disseminate comprehensive traffic information to the public. This service, provided by SmartRoute Systems, is making the highway video available to local TV and radio stations and maintains an internet web site with real-time, route specific traffic reports for all of Southeast Michigan. And soon, drivers will be able to access traffic advisory information using their cell phones or receive traffic updates on their pagers and cell phones." Also, the Intelligent Transportation Society of Michigan (ITS Michigan) is an umbrella organization uniting the public and private sectors to promote and enhance the deployment of technology to improve transportation. Members include, for example, MDOT, SEMCOG, and the Road Commission for Oakland County (RCOC), Wayne County, the Road Commission of Macomb County, the City of Detroit Department of Transportation, Suburban Mobility Authority for Regional Transportation (SMART), General Motors, Ford Motor Company, Daimler Chrysler, AAA Michigan, and the University of Michigan. Ontario's Ministry of Transportation (MTO) has begun deployment of COMPASS, a freeway management system, to respond to traffic congestion problems on urban freeways. The initial leg on the COMPASS system was completed in the greater Toronto area in the early 1990's. The ministry's newest ITS initiatives continue to focus on the Toronto and Ottawa areas and, as such, there are currently no documented plans for ITS in the Windsor/southern Ontario area. Table 1 provides a listing of the principal transportation-related telephone services currently being provided in the metropolitan Detroit area (in alphabetical order of the operating agency). The Detroit Department of Transportation's toll-free number is an automated telephone system accessible 24 hours a day, 7 days a week providing the following bus information services: trip planning assistance, general route information, scheduling information, and comments/suggestions. This section describes the transportation (roadway and transit) and telecommunications (landline and wireless) institutions in southeastern Michigan and southern Ontario in order to understand the potential players in a comprehensive 511 deployment. Michigan Department of Transportation (MDOT) - MDOT is the state's transportation agency with headquarters in East Lansing and having seven regional offices across the state. MDOT has jurisdiction on the 9,725 route-mile state highway system. The system includes over 27,000 lane miles, almost 4,500 bridges, and approximately 4,000 traffic signals. Almost 35 percent of the statewide annual vehicle miles traveled occur in the Detroit metropolitan area ("Metro Region") even though the area only represents 16 percent of the state's lane mileage. 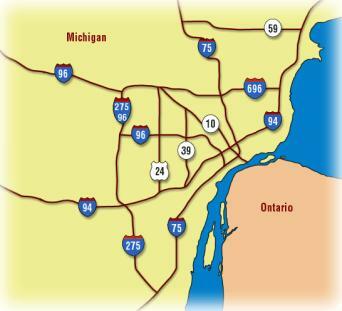 MDOT's Metro Region is where the MITS Center for ITS operations on the Detroit freeways is located. The MITS Center also houses the Michigan State Police (MSP) District 2 Dispatch Center. All MSP resources for southeastern Michigan, including Wayne, Oakland, and Macomb counties, are dispatched from the MITS Center. The dispatch center also is the public safety answering point (PSAP) for the area's wireless 911 calls. Southeast Michigan Council of Governments (SEMCOG) - SEMCOG is a regional planning partnership, accountable to member local county governments in Livingston, Macomb, Monroe, Oakland, St. Clair, Washtenaw and Wayne Counties. As a comprehensive regional planning agency, SEMCOG has technical staff working on problems of transportation, including traffic safety, traffic engineering and regional airport planning. SEMCOG also provides a free regional RIDESHARE program with car and vanpool matching services for individuals, businesses and other organizations as well as offering telecommuting assistance. Road Commission of Oakland County (RCOC) - RCOC maintains 2,600 miles of county roads, over 310 miles of state highways and more than 1,200 county, city and state traffic signals in Oakland County. RCOC utilizes an advanced arterial ATMS system called FAST-TRAC (Faster And Safer Travel Through Routing and Advanced Controls), which employs state-of-the-art computer and communications technologies to improve traffic flow, decrease travel time, enhance safety and reduce the vehicle tailpipe emissions at signalized intersections. Wayne Road Commission - Wayne County offers a free e-mail alert system that reports on possible delays on more than 1,000 miles of major streets and freeways due to construction and maintenance activities. The county is also planning to deploy a toll-free telephone number for construction information in 2001. Macomb County Road Commission - The Road Commission of Macomb County constructs, operates and maintains 2,942 lane miles of county, primary and local roads as well as 756 bridges and drain structures. Further, the Road Commission maintains 166 miles of state trucking routes and freeways under contract for the Michigan Department of Transportation. Detroit Department of Transportation (D-DOT) - D-DOT is the largest bus transit carrier in Michigan and it is responsible for operating the Detroit's fleet of 540 buses along 54 fixed-route bus lines and serving over 80 percent of the region's bus passengers. D-DOT also operates the Detroit People Mover (DPM), which is a fully-automated light rail system that operates on an elevated single track loop in the central business district with 13 stations, and the Downtown Trolleys, which is a fleet of nine trolleys features seven closed vehicles and two open-air vehicles. Suburban Mobility Authority for Regional Transit (SMART) - SMART is responsible for the planning, construction and operation of the public transportation facilities and services within four counties of southeastern Michigan (Wayne, Oakland, Macomb, and Monroe); excluding the City of Detroit in which this responsibility belongs to the Detroit Department of Transportation. Currently, SMART has a fleet of 435 buses. In January of 1994, the North American Free Trade Agreement (NAFTA) created the largest single free trade market in the world by dropping the trade barriers between Mexico, the United States and Canada. Combined, the following two (2) Detroit/Windsor border crossings handle more than one-third of all trade volume between the U.S. and Canada. Ambassador Bridge - In 1970 when I-75 was completed through downtown Detroit, the Ambassador Bridge became directly connected to the Interstate system via I-75. In the early 1990's, the bridge became the busiest international border crossing in North America. It is estimated that over 25 percent of all merchandise trade between the U.S. and Canada crosses this bridge by truck, much of which is "just-in-time" delivery via high-speed trucks. Detroit-Windsor Tunnel - The Detroit/Windsor Tunnel is a one-mile vehicular border crossing considered to be the second busiest crossing between the United States and Canada. Spanning the Detroit River between Detroit, Michigan and Windsor, Ontario, connecting the US Interstates (I-75, and I-94) to Ontario's Highway 401. 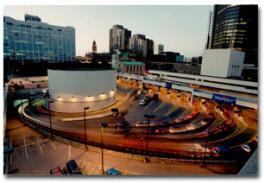 Motorists can tune into AM 760 WJR, the tunnel's only radio station for regular programming and traffic information. Ontario Ministry of Transportation (MTO) - The MTO is responsible for over 16,500 centerline kilometers in the Canadian province of Ontario, which includes the cities of Toronto, Ottawa, and Windsor. The MTO's ITS initiatives to date have centered on the greater Toronto area which is over 220 miles northeast of Windsor. Highway 401 is the southern backbone of Ontario connecting Detroit/Windsor to Montreal through Toronto. Highway 402 connects Sarnia, Ontario, and Port Huron, Michigan, via the Blue Water Bridge, which is the third busiest international crossing. Transit Windsor - Transit Windsor provides public transit service to residents of the City of Windsor, Ontario, and surrounding communities with a fleet of over 100 transit coaches. During the last couple of decades, Transit Windsor has diversified through increased ventures including charters, servicing special events, and international operations. Various telecommunications infrastructures in Michigan, such as landline and wireless companies, and the Michigan Public Service Commission (MPSC), which regulates all landline telecommunications, would be involved in an abbreviated dialing implementation. Any such implementation would have to adhere to the Michigan Telecommunications Act (MTA) of 1991, passed by the Michigan Legislature in an effort to improve opportunities for economic development and promote customer choice. The MTA revised the MPSC's role in telecommunications regulation and is designed to promote competition in the marketplace. The Michigan Public Service Commission is a three member regulatory body that is responsible for three (3) operating divisions - electricity, natural gas and communications. The Commission's mission statement "is to formulate and administer policies and regulations necessary to ensure that regulated energy and communication and transportation services are provided in an efficient, reliable and safe manner sufficient to adequately meet the needs of Michigan citizens." Some of the goals of the MPSC are to: 1) provide a fair and efficient ratemaking process that accurately identifies revenues needed to provide regulated services, balances cost to consumers, assures adequate supply, reliability and safety, and to 2) provide for reduced regulation and increased reliance upon market forces where competition is sufficient to protect the public interest. - There are currently 39 Incumbent Local Exchange Carriers (ILECs) that are licensed by the state to operate in Michigan and 154 Competitive Local Exchange Carriers (CLECs). Although there are multiple ILECs, Ameritech and Verizon (formerly GTE North) are the predominant local telephone exchange carriers. - Wireless providers who have a presence in Michigan, including the Detroit metropolitan area, are: SBC/Ameritech (Cingular), Verizon, Sprint PCS, AT&T Wireless, VoiceStream, Nextel, and Cellnet (a re-seller of Ameritech). - In 1999, the most recent year for complete data, the MPSC staff registered 161 payphone providers and 58 operator service providers (OSP) under MTA provisions that require all payphone and OSPs operating in Michigan to register with the Commission. The Canadian Radio-television and Telecommunications Commission (CRTC) was established by Parliament in 1968. It is an independent public authority constituted under the Canadian Radio-television and Telecommunications Commission Act (R.S.C. 1985, c. C-22, as amended) and reports to Parliament through the Minister of Canadian Heritage. The CRCT is an independent public authority in charge of regulating and supervising Canadian broadcasting and telecommunications as governed by the Broadcasting Act of 1991 and the Telecommunications Act of 1993. Under the Acts, the Cabinet may appoint up to 13 full-time and six part-time commissioners for renewable terms of up to 5 years. Only full-time commissioners are involved in the decision-making process for telecommunications, but all commissioners participate in broadcasting decisions. Full-time positions include that of the chairperson, the vice-chairperson of broadcasting, and the vice-chairperson of telecommunications. The CRTC regulates more than 61 telecommunications carriers including major Canadian telephone companies. In 1999, the CRTC processed 1,533 telecommunications applications, issued 1,230 orders and granted 90 licenses to telephone companies that provide international long distance services. - The Ontario Telecommunications Association (OTA) lists 22 ILECs in Ontario with Bell Canada being the predominant local exchange carrier. - There are five (5) wireless service providers in Canada. They include Rogers Cantel (a division of AT&T), Mobility Canada, Clearnet, Microcel, and Telus Mobility. Michigan Public Service Commission - In April 2000, the Michigan Public Service Commission (MSPC) took up the petition request by Volunteer and Information Services, Inc., to grant assignment of the 211 abbreviated dialing code in one county in Michigan. Both Ameritech Michigan and GTE North (now Verizon), the 2 largest LECs in Michigan, both commented against the petition citing, respectively, that "assignment of N11 codes should be left to the FCC to maximize public benefit" and "the Commission (MPSC) lacks jurisdiction to assign N11 dialing codes...(and) that N11 codes should be used for national purposes." Both Ameritech and GTE North stated that there are "technical and administrative issues" that need to be resolved "comprehensive(ly) and consistent(ly)." The MPSC commission staff also noted that the FCC was going to be ruling shortly on the assignment of N11 codes and "there are unresolved questions about the costs and recovery mechanism." Canadian Radio-television and Telecommunications Commission - In November, the Canadian Radio-television and Telecommunications Commission (CRTC) took public comment on "formulating a policy for assigning the few remaining unused three-digit access codes: 211, 311,811 and 511." The existing abbreviated dialing codes in Canada are: message relay service (MRS) for the deaf - 711, emergency - 911, directory assistance - 411, and repair services - 611. On the same date, the CRTC also heard two separate petitions for three-digit access codes by the United Way and the Canadian National Institute for the Blind (CNIB). The United Way was petitioning to use 211 for "information and referral services relevant to community, government, health, and social agencies." The CNIB was seeking an unspecified "three digit access code" for "information services for certain blind and print-handicapped persons...for a small monthly fee to maintain this service." The United Way's proposal sought that all local and long distance service providers be "required to route 211 calls to a seven- or 10-digit number," and "that 211 calling be enabled on payphones." Other stipulations included that wire line 211 calls be free while wireless callers are just charged air time, and that "each telecommunications carrier would bear the re-programming switching costs." The CNIB's petition was two-fold: allocate a three-digit N11 dialing code, and require "that the code be activated by all local exchange carriers (LECs) and wireless service providers with routing to a toll-free number." Cost recovery was to be covered "through a monthly telephone subscriber per-line charge." An FCC Rule and Order in February 1997 reserved 311 for abbreviated dialing for non-emergency police information. In July 2000, 311 was initiated in the City of Detroit by the Police Department. It is targeted and publicized for the following purposes: to file a police report for an incident that already happened (break-in, auto theft, and illegal dumping), to get information about someone in police custody, to report an abandoned vehicle, to make a noise complaint, to make an animal or drag- racing complaint after the incident is over, to report an open fire hydrant, to report neighbor trouble, and to report cable or utility theft. It is funded by a telephone surcharge entitled "Public Act No. 29" that was enacted in March 1994 by the Michigan Legislature which granted Wayne County the right to utilize a telephone surcharge as a funding mechanism for emergency communications (911). Based upon Public Act No. 29, the Wayne County Board of Commissioners authorized to attach a 4% operational charge to all telephone users in the Detroit Emergency Telephone District (DETD). Pursuant to this authorization, the Detroit City Council approved a resolution designating the local telephone carrier (Ameritech) to collect the 911 telephone surcharge funds and send the proceeds to the (DETD). There are no additional charges to the public to pay for the system. Since 1983, the Detroit Police Department had serviced the Detroit community with a seven (7)-digit number for crime reports and non-emergency calls for service. However, once the FCC reserved 311 in February 1997, efforts moved forward to adopt this emerging abbreviated dialing system. Access for the usage of 311 is restricted to within the boundaries of the City of Detroit via land line telephones only. The calls are routed to a call center consisting of thirty (30) call taker positions. Those call taker positions are serviced by four (4) trunk lines, two of which are T-1 lines with twenty-four (24)-channel capability. The City of Detroit, in partnership with Ameritech, marketed the 311 concept through local print and electronic media to the general public. This was accomplished through public service announcements as well as on radio, news and cable stations. Ameritech also provided information on the new initiative by printing information on its monthly billing to the City of Detroit residents. Lead Implementing Agency - As the umbrella transportation organization in the State of Michigan and the central repository of real-time traveler information on the intra and inter-state highways in the metropolitan Detroit area (MITS Center), the Michigan Department of Transportation is the lead statewide 511 implementing agency. MDOT envisions making provisions for a statewide 511 deployment to implement two regional 511-service areas - Detroit/SEMCOG and Grand Rapids - overlaid by a statewide system. These two areas can be the anchor systems for connectivity to a statewide default system (possibly an enhanced version of the existing statewide construction hotline, 800-641-MDOT) in all other areas of Michigan. The granularity of the rural area information should not be expected to be the same as within the Detroit and Grand Rapids areas. Regional Detroit Coverage Area - The Southeast Michigan Council of Governments (SEMCOG), as the regional transportation planning organization, should be an active coordinator with MDOT for 511 implementation in the greater Detroit area. Because of the regional significance of transportation issues and SEMCOG's broader reach across southeastern Michigan, the minimal coverage area for 511 should be all of the southeastern Michigan area. The city of Windsor, Ontario should also be considered a part of the 511-watershed area because its proximity to Detroit makes it more connected to the US than the rest of Ontario. International Issues - With the growing importance of free trade in North America, Interstates 94 and 75 in Detroit, the three international border crossings (Ambassador Bridge, Detroit-Windsor Tunnel, and Blue Water Bridge) and Highways 401 and 402 in Ontario are the backbones of goods movement across the Midwest and between Mexico and Canada. The deployment of a comprehensive, regional 511 telephone system and advanced commercial vehicle operations (CVO) will assist in facilitating a large percentage of "just-in-time" truck deliveries across the national transportation system in real-time. Regulatory Commissions - In order to deploy 511 in a comprehensive fashion, it is necessary that the lead implementing agency work closely with the regulatory commissions while enlisting early comment and support from the telecommunications associations. As the recent abbreviated dialing activities indicates, both the MPSC and the CRTC value the importance of the three-digit dialing code as a scarce resource. Consequently, MDOT, as the lead agency, should develop a comprehensive plan for 511 including the information content, cost recovery, and marketing and promotion. The information delivered by a 511 system in a metropolitan area, such as Detroit, is expected to be real-time, specific yet concise, and focused on non-recurring incidents for both the traffic and transit networks. As traffic congestion in the Detroit metropolitan area continues to rise, transit usage will grow in importance and real-time transit information will be a part of the 511-menu option. Area Code Proliferation - As with most other major urban areas, the scarcity of phone numbers due to the expansion of communication needs, has promulgated the need to carve out more area codes and make 10-digit dialing necessary even on local calls. Thus, making use of the precious resource of 511 for abbreviated dialing is heightened, and would quell the need to have more 10-digit numbers for traveler information. Private Sector Partners - The importance of the private sector should not be underestimated during 511 deployment. Organizations such as ITS Michigan and AAA Michigan, as well as the automobile manufacturers, should be consulted at all phases of the implementation. The role of automobile manufacturers in traveler information will continue to expand over the next five years, as in-vehicle devices (telematics) become standard features on all automobiles. Telematics will enable the other spectrum of traveler information, other than real-time, route-specific, to become viable - route guidance and destination specific information on advanced technologies (e.g., mobile phones, PDAs, in-vehicle displays...). The Michigan Department of Transportation has identified that the successful implementation of 511 statewide requires a consolidation of all currently operating traveler information telephone numbers under a single point of contact. This would require the consolidation of information consisting of real-time roadway conditions, congestion, incident, and construction information as well as transit service/scheduling, weather, and airport delay information. Currently across the state of Michigan, traveler information is available by telephone from MDOT, AAA, AMTRAK, and various bus systems. The Michigan State Police along with local cities and counties do not provide any telephone information. Most travelers currently receive information via commercial radio. The Internet and television do provide information but one must have access to use it. This means, in most instances, the information is not available on demand and not specific to an intended destination. An abbreviated dialing 511 system could provide information to travelers a few hours in advance of their arrival to a particular destination. A telephone based traveler information system, such as 511, may present some safety concerns for wireless telephone users. Motorists are encouraged to make calls prior to travel to eliminate the need of having to interact with a menu driven system en-route, although voice activated phone systems can alleviate this potential problem. The costs of developing and operating a 511 system that is free for citizens to use could be significant especially on a statewide basis. A more detailed study will be undertaken in Michigan to accurately estimate the costs. The Michigan Department of Transportation considers that the implementation of a 511 service in the state of Michigan can offer a very unique, relatively low cost, and readily available means for acquiring traveler information relating to many modes of travel. This abbreviated dialing system would allow citizens to obtain a wide range of traveler information without the use of a computer or radio before a trip is started or by and en-route use of a cell phone. This service, when implemented, will bring together several telephone based traveler information systems in Michigan that are in operation but not well known by travelers and, therefore, not widely used. The Michigan Department of Transportation plans to proceed with developing an implementation plan for 511 services statewide in Michigan, which will define the concept of operations and the costs of deployment. The implementation plan will include information and coordination with the following entities: Ameritech and all of the wireless telecommunications providers, the Michigan Public Service Commission, county road commissions, transit providers, airport operation agencies, and the MDOT regional administrators. - Ameritech has suggested, and the Michigan Public Service Commission (MPSC) has agreed, that MDOT host a meeting of the appropriate agencies to bring the issues to the table. - MDOT and Ameritech will develop a plan for implementation and file a tariff to MPSC for 511 in Michigan; the tariff document is required to go into the details of service, cost, charges if any, to the caller, and a time frame for implementation. - Several other telecommunications companies in Michigan, including the wireless providers, would also need to make a decision to file their own tariffs primarily to connect with the main service to be provided by Ameritech. The state of Michigan has been designated by US DOT as an "early adopter" region. As the lead transportation agency in Michigan, the Michigan Department of Transportation can quickly engage the Michigan Public Service Commission for reservation for the abbreviated dialing code. MDOT, through its MITS Center, has a substantial ATIS capability in place for the southeastern area of the state. The addition of a 511 Interactive Voice Response (IVR) telephony system as an additional layer to existing ITS services is feasible. Groundwork is required with the Michigan Public Service Commission and partner groups such as ITS Michigan and AAA Michigan. International issues regarding the US/Canada border need to be addressed. Opportunities with the automotive industry and the developing telematics products have potential for widespread 511 applications. Pertinent web sites containing various documents and reports have been referenced in order to build this case study. Both specific (noted by superscript number) and general (alphabetic order) links will be listed below to encourage more research of the information herein. The following websites were referenced for the pictures and graphics used herein (in the order in which they appear). The principal point of contact for the Detroit 511 deployment is Deputy Director Louis Lambert of the Michigan Department of Transportation (lambertl@mdot.state.mi.us or (517) 373-0343). The principal authors of this case study are David Fierro and Patrick Shortal of SmartRoute Systems (SRS) dfierro@smartroute.com, (352) 241-0726 or pshortal@smartroute.com, (305) 271-5850.